This guide will cover the most effective ways to enhance your ninjas while conserving your Ryo for future use. Aside from leveling up to increase stats, this guide will also introduce useful methods to efficiently use boosters or pill bottles. - As much as possible, your "Base" and "EXP Materials" should have the same Elemental Affinities when enhancing, to get 1.5x EXP gain. *Sell for Ryo = explanation at the bottom part of this guide. - Ryo Cost = Lvl of Base Ninja x 100 Ryo. - As your ninja levels up, the Ryo cost for every material will also increase, so it's best to focus on farming and using Ramen as you main EXP Material. - When enhancing, select all EXP Materials that you have available, up to 10 items max per upgrade. - Farm from Emergency Missions, start from Cup [C] first to get 1* and 2* Ramen, until you are able to complete Cup [B]. - For early game, this is best done when you are about to Lvl Up (Ninja Rank) but still have at least 15 Stamina for the attempt. - Select the stage that requires a Mono Element team (25 Stamina), not the All-Cup [B] stage because it's harder. - The Cup [B] stage's Element condition differs depending on the current day. - At least 1 Healer, preferably Kabuto Yakushi - The Sound's Spy, or Shizune - Tsunade's Attendant. You can also use 3* Iruka - Sympathizer or any available 4* healers that you have. - Note: Healers may ignore the Element condition if you like, but do not use them as tank or if their Element is at a disadvantage, like using Iruka vs Skill enemies because it would be very messy. - Front Ninjas: 2 front ninjas that are Lvl 25+/30+. Follow the suggested Element of the stage to make things easier, but for vs mono Bravery or Wisdom, go neutral with Lvl 40+ ninjas. - Buddies: Any 2 Buddies you like (these ninjas can also help increase your team's Total Health). - Add 1 Friend: Simply select the strongest one available, with the appropriate Element. 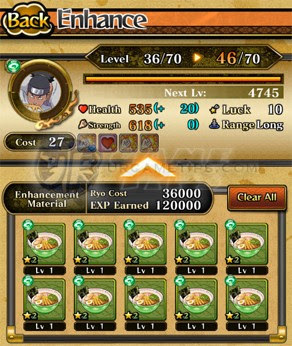 - Once you have enough 2* Ramen, go ahead and enhance your ninjas. - If you are wondering: 10 2* Ramen can actually Lvl up a Lvl 42 ninja to Lvl 50. - We also have a separate guide on how to level up your ninjas fast, by using the "Gather Friends" and "Multiplayer" modes. - Using the methods on that guide will enable you to MAX out a Lvl 1 5* ninja to Lvl 100 6* one within a day. Aside from leveling up, you can also increase the stats (+Values) of your ninjas by feeding them Boosters or Pill Bottles. - Note: Luck affects drop rates. - #1: You have a Lvl 1 ninja that you will definitely use as one of your main (example: newly summoned ninjas). - #2: You just awakened one of your core ninjas (back to Lvl 1), use this opportunity to max out his/her +Values while the Ryo cost is low. - Feeding them directly to your high Lvl ninjas will cost you a lot, so the best thing to do is to feed them first to your Booster Carriers then enhance your main ninja to transfer the +Values. - Booster Carriers can be 2* or 3* Ninjas. You can get them from Story Mode Stage drops. - The +Values of the ninjas will turn "Yellow" once the cap is reached. Use the chart above as your guide and to avoid over boosting your carriers or core ninjas. - Luck affects the drop rates of items during battle. 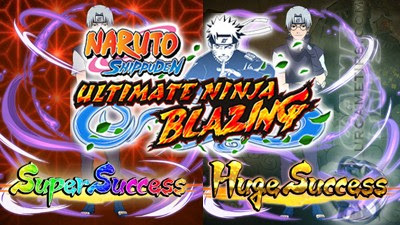 - The only way to increase the Luck stat of your ninja is by fusing duplicates. The Base and Material to be used must have exactly the same name and title, even if they have different Lvl or number of stars. - These are the icons that you can find at the right side your ninjas' info screen. - Same as above, the only way to activate these abilities is by fusing duplicates. - To add a new ability (not active), increase the number of stars of your ninjas. - Some ninjas rewarded from special events will get a fully active abilities. - Some dupes are worth keeping, like having 2 Kabuto Yakushi - The Sound's Spy. Ninja Road: New Way To Upgrade Abilities! - Recommended only if you have a handful of ninjas to work on. - If completed, the all new Ninja Road Mode can also reward you an "Acquisition Stone Sctivation Crystal". An enhancement material used to unlock your any character's ability. - Note: This item will have no effect on characters with fully upgraded abilities. - The more Abilities you acquire, the more Character Cost will be decreased. - With the exception of particular characters, characters with a Cost of 4 or less will not incur a Cost reduction due to Ability acquisition. - The amount of Cost reduction incurred via Ability acquisition varies per character. Aside from expanding your inventory to add more space, you can also use these tips to free up some space. - This one is simple, as you gain more rewards, some of the items will go to your Present Box, so to keep your inventory free, do not use the "Take All" option, just take what you need and let the other items stay in your Present Box. - Now you have an extra inventory with 80 slots, but keep it below 60 or 70 though for the new items. - Warning: Items that are 90 days old will automatically get deleted, so watch out. - Once you are able to easily farm Cup [B] stages, 1* Ramen will become almost useless. - To free up space and gain some Ryo, just fuse your 1* Ramen to your 2* Ninjas (same element), then sell them. - It's 1 Ramen for 1 Ninja, you can get more Ryo by doing this (follow same element). - Fusing 1* Ramen to a 2* Ninja will give you a Lvl 6 Ninja = 1800 Ryo when sold. - Fusing 2* Ramen to a 2* Ninja will give you a Lvl 14 Ninja = 4200 Ryo when sold. - Only fuse 2* Ramen to a 1* Ninja, and only if you don't have any 2* ninjas available. - Fusing 2* Ramen to a 1* Ninja will give you a Lvl 18 Ninja = 1800 Ryo when sold. - The Total Ryo earned above is higher because of the Huge Success and Super Success multipliers. - 1* and 2* Ramen can be obtained from Friend Summons or farmed from Cup [C] missions. - You can also farm 2* or 3* Ramen if you like then feed them to your 2* ninjas. 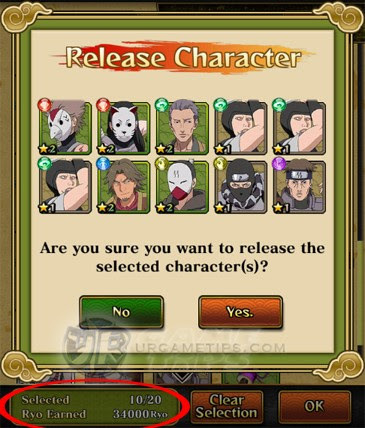 - 1* and 2* Ninjas can be obtained from from Story Mode Stage drops. - Although this is not the best way, it is still ok, especially when you can no longer find a stage where you can get some Ryo as a one-time reward, and if you can't wait for the Ryo based missions every weekends or even the 3 hours limited time Get Rich Quick events.